You want to connect a switch to your Raspberry Pi so that when you press it, some Python code is run. Open an editor (nano or IDLE) and paste in the following code. As with all the program examples in this book, you can also download the program from the Code section of the Raspberry Pi Cookbook website, where it is called switch.py. You will notice that the switch is wired so that when it is pressed, it will connect pin 18 configured as an input to GND. 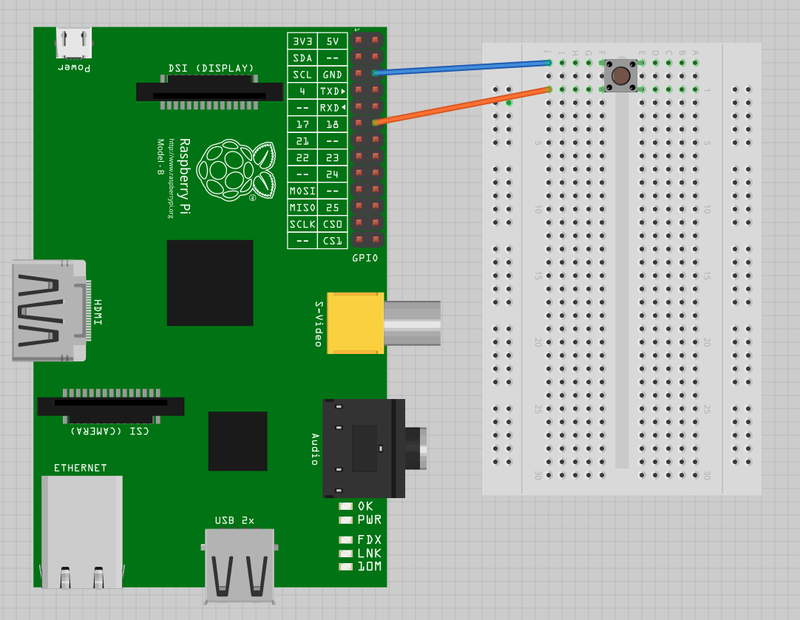 The input pin is normally pulled up to 3.3V by the optional argument pull_up_down=GPIO.PUD_UP in GPIO.setup. This means that when you read the input value using GPIO.input, False will be returned if the button is pressed. This is a little counterintuitive. To use a switch to trigger an interrupt, see “Programming with Interrupts”. To debounce a switch, see “Debouncing a Button Press”. To use external pull-up or pull-down resistors, see “Using an External Pull-up Resistor”.